It must be taboo to post two pumpkin recipes back to back. It likely breaks some unspoken blogging rule and a few of you might be personally offended with my blatant love of pumpkin. Well, if you are the type to take offense to such things, I simply cannot apologize. Choose a different battle, my friend! Here in NYC, this fall has been one of the most beautiful that I can remember. 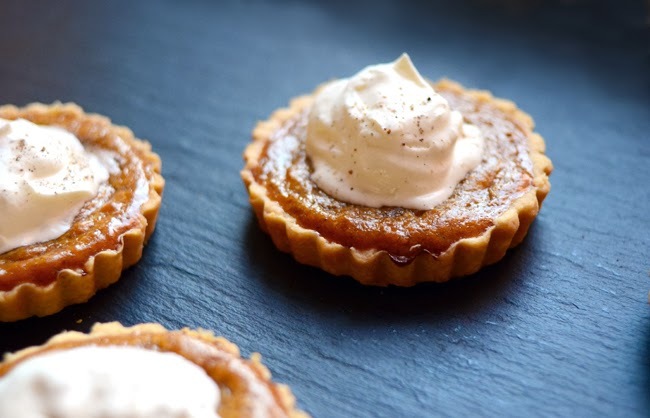 The vibrant leaves and festive cheer seem to have lasted for weeks and with Thanksgiving just around the corner, my pumpkin obsession has yet to be exhausted. 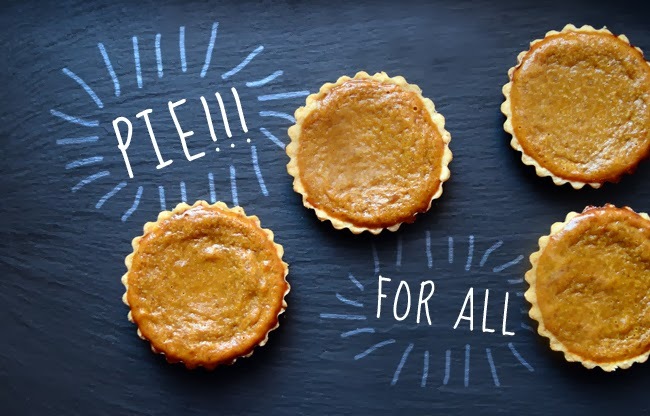 These pies are easy, adorable and extra special with a touch of cardamom. 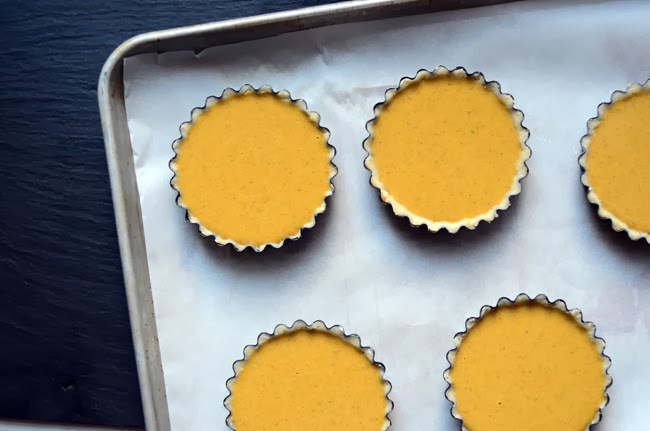 The only thing you really need is a set of mini tart pans and you can get them here. 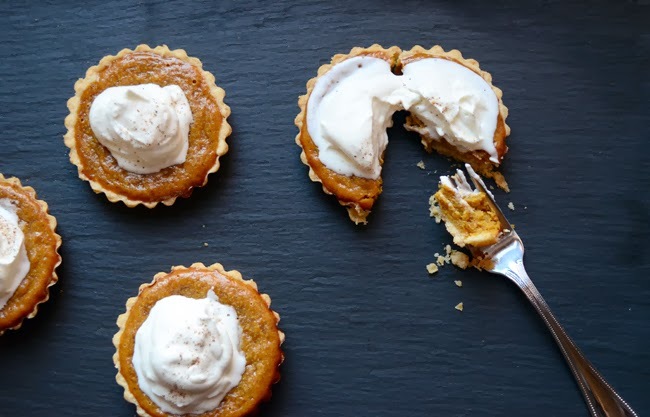 If you don't want to make individual pumpkin pies (and why wouldn't you?!) you can go ahead and make a traditional sized pie. 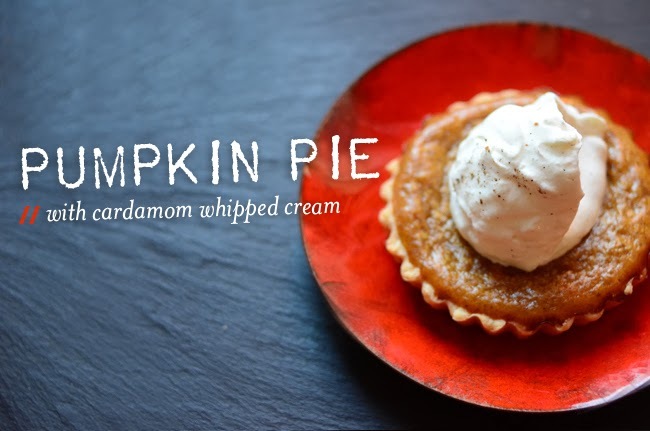 But I assure you, your Turkey Day guests will love their own individual dessert. If my next post is pumpkin again, I may need some sort of intervention. Until then, enjoy! 1. Preheat the oven to 375 degrees. Roll out the chilled pie dough on a floured work surface. Dough should be about 1/8" thick. Cut approx. 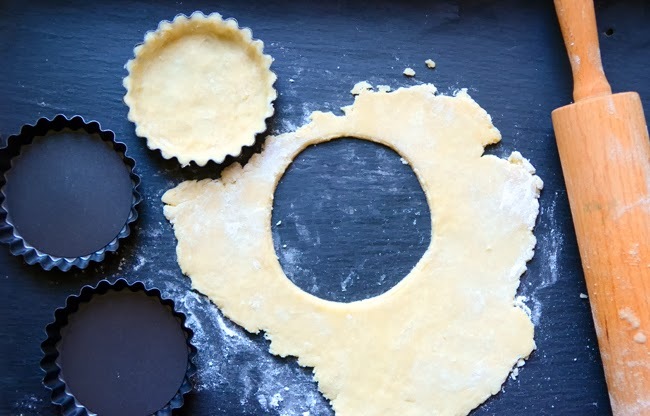 5" circles out and press into mini pie tins. 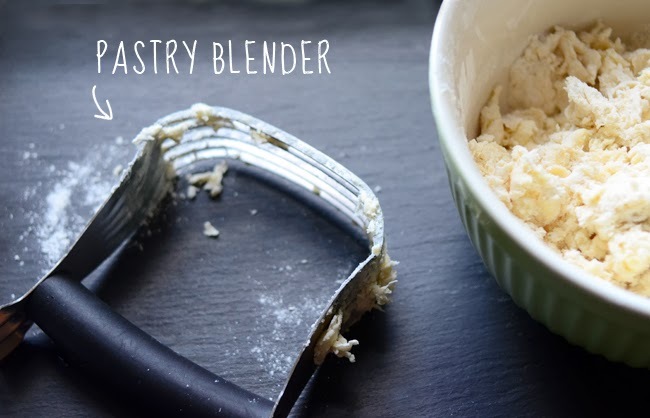 Cut off excess dough with a knife, re-using any extra scraps. Set prepared tins on a baking sheet and chill until ready to bake. 2. 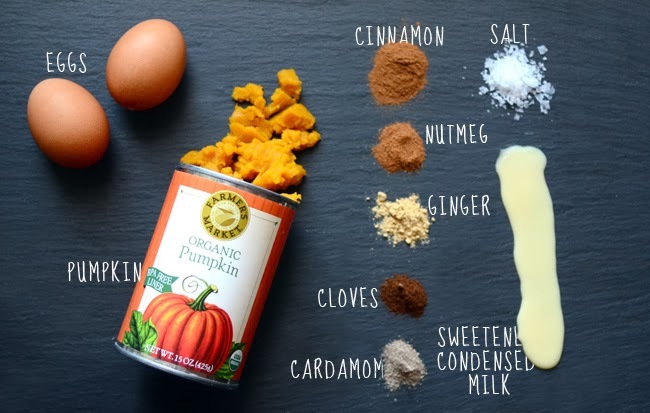 Combine pumpkin, sweetened condensed milk, eggs, cinnamon, nutmeg, cloves, ginger, cardamom and salt in a large bowl. Whisk together until ingredients are incorporated. Pour filling mix into prepared pie shells and bake for 20 minutes or until edges are set and the middle is still slightly wobbly. Let cool completely before topping with whipped cream. 1. In a large bowl, combine flour, sugar and salt. 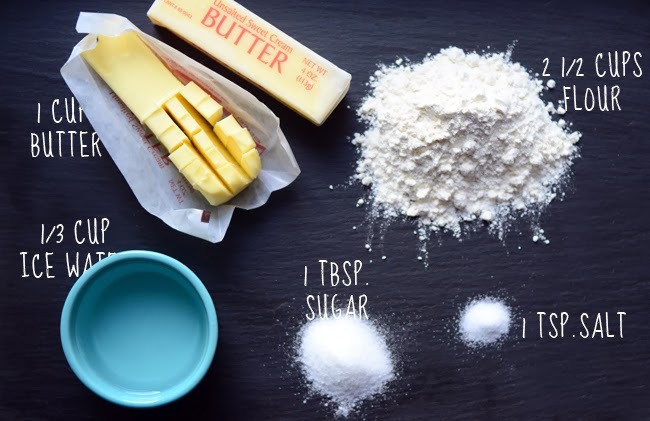 Use a pastry blender or a large fork to cut the butter cubes into the flour mix, working quickly and incorporating all of the flour mixture until the butter pieces are the size of tiny peas. Make sure you don't over-work the butter. Visible chunks of butter = tasty flakiness! 2. Slowly drizzle the ice water into the flour mixture. Mix until the dough just begins to pull together, drizzling more water if needed. (You might not use all of the water.) Pull dough together into a ball and wrap tightly with a piece of plastic wrap. Form the dough into a disk and chill in the fridge for at least one hour. Use an electric mixer to beat about 1 1/2 cups chilled heavy whipping cream on high speed until soft peaks form. Mix in 2 Tablespoons of powdered sugar and 1/4 teaspoon of cardamom and beat for another 30 seconds. When ready to serve, top pies with a heaping spoonful of whipped cream.